What began as an inn has evolved into a resort following the addition of six Har-Tru courts, its own summer tennis camp, a 21,000-square-foot full-service spa, and a culinary kitchen. Guests bed down in and of the 120 handsomely decorated rooms—some with gas-log stoves, whirlpool baths, or even kitchenettes—and dine on meals that focus on local Vermont produce. An added bonus is the inn's proximity to the airport in Burlington. Among its unusual features is a teaching kitchen, where a variety of classes take place, focusing on a variety of dishes or ethnic cuisines, as well as sessions on wine tasting. Tennis Staff. Tennis director Rob Barr, whose 25 years of teaching experience include stints coaching players on the WTA and ATP Tours, runs the Essex's tennis programs. 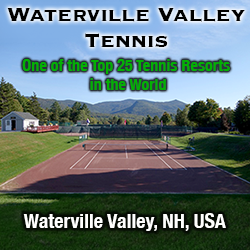 Their showcase package has been dubbed "Vermont Tennis Vacations," a customizable getaway comprised of five hours a day of instruction, drills, and social competition, with or without breakfast, lunch, and lodging. This 2-to-5-day program covers technique, strategy, shot selection, match psychology, and movement, utilizing fast-paced competitive drills. Helping Barr during part of the summer is Anders Lundberg. He played for the University of Texas and has been ranked No. 1 in his native Sweden in three different age divisions. Together they make a very personable team. Tennis Programs. Aside from the camp, the resort stages a weekly roster of tennis activities and events during the May to October outdoor season. These include daily stroke clinics, junior clinics, and mixed scrambles. Courts & Fees. There are six Har-Tru courts. Court fees: None for camp participants or hotel guests. Golf Courses. The Inn also owns the Links at Lang Farm, a 4,100-yard, 18-hole, par-60 course with a full practice facility and a clubhouse. Each of its holes has multiple tees to accommodate golfers of differing abilities. In addition, the Inn can make arrangements for guests to play at local courses, including the Vermont National Country Club, the only New England course designed by Jack Nicklaus. Spa & Fitness Center. The 21,000-square-foot, two-story, white clapboard spa backs up to the woods at one side of the property just across from gardens and white picket fence surrounding the outdoor pool. It's a peaceful place of stone and wood, with fireplaces in the men's and women's lounges, maple flooring, and picture windows. The menu of treatments is broad, from the sports massages I crave to a coffee almond detox or calming honey lavender exfoliation. The fitness center has been furnished with high-quality (and quiet) TechnoGym equipment and a variety of cardio stations, all situated in a room with views on the forest. There's also a 25-meter indoor lap pool, a Jacuzzi on an outdoor terrace, and sauna and steam rooms. And ... At the back of the property stands an adventure center that focuses on team building programs but also has a recreational menu of zip lines, rock and ice climbing wall, an overhead challenge course, and more. There's also hiking and biking in the nearby mountains and woods, and guided fly fishing trips. The inn has 120 rooms and suites. Nearly half have Vermont hearthstone stoves or fireplaces. Each is individually decorated. There are two dining options: The Tavern & Junction. The Tavern serves Vermont pub fare and has an extensive list of craft beers on draft. The Junction, which has an open kitchen, showcases local Vermont products. Travel Instructions. Burlington International Airport is the principal gateway into Vermont, whether from Canada or the U.S., with service from many of the major airlines. Major car rental agencies are located in the terminal itself. To reach the Inn from the airport, take a left out of the terminal onto Airport Drive. Travel ½ mile to Williston Road, turn left and continue for 1.7 miles to Industrial Avenue (first set of lights). Turn left for 1½ miles to the next light. Turn left again onto Route 2A North for 1.8 miles to a 5-way intersection in Essex Junction. Bear right onto Route 15 East for 1½ miles to VT 289 East and then .2 of a mile to Exit 1O, Essex Way. Turn right and a quarter-mile along you'll see the entrance to the resort on the left.